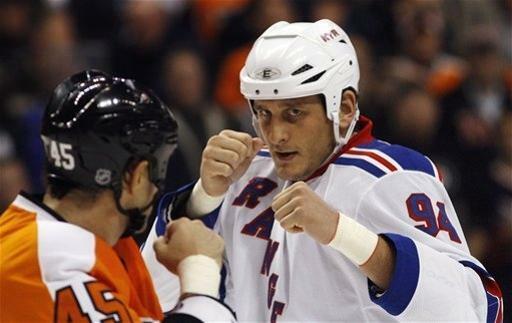 On May 13, 2011, Derek Boogaard died from an accidental overdose of painkillers while consuming alcohol. Over three years later, law enforcement officers arrested two men they believe provided Boogaard with those narcotics illegally. Law enforcement sources tell FOX 5 in New York that Jordan Hart, the son of New York Islanders legend [sic] Gary Hart, was arrested Tuesday morning on Long Island by the DEA's New York drug enforcement task force. Sources said Hart was supplying Boogaard with the prescription painkillers that killed him. He could 20 years in prison, if convicted. Also arrested was Oscar Johnson, a physician's assistant in Utah. Johnson is accused of writing Percocet prescriptions for Jordan Hart on a near-monthly basis for 2 years, totaling 2,920 pills. The report says that Hart began selling pills to Boogaard in Nov. 2010, when he was a member of the New York Rangers. Jordan Hart’s father Gerry Hart played for the Islanders from 1972-1979. Jordan played for the Utah Grizzlies of the ECHL for two seasons (2007-09) and Islanders’ AHL affiliate in Bridgeport in 2008-09 for six games. He appeared in a lower Manhattan court on Tuesday. Boogaard was a fan favorite for his pugilism during a six-year NHL career with the Minnesota Wild and New York Rangers. After his death, Boogaard became a cautionary tale about how players cope with pain and how teams medicate their players. His father compiled documents after his death that showed Boogaard had over 100 prescriptions for pills from a dozen team doctors from the Wild and Rangers. A New York Times story reported that Boogaard was receiving prescriptions for hydrocodone and Ambien despite the Rangers team doctors being aware of his then-current addiction to pain pills and his previous addiction to sleeping pills. He pled guilty to a gross misdemeanor of “interfering with the scene of a death” and did no jail time.